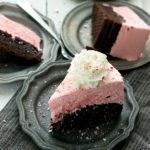 This delicious frozen peppermint cheesecake is an easy make-ahead dessert with phenomenal results – the brownie crust with the light peppermint cheesecake topping is a great combination! Happy week of Thanksgiving everyone!! Of course, it may seem like I’ve skipped Thanksgiving since we started Christmas here on CMA a few days ago, but my apology for that is in the form of this brownie cheesecake. And this is probably the best form of an apology EVER because this cheesecake is dang good. I mean, it has a brownie crust…can you go wrong with a brownie crust?! So let’s talk about this dessert – the brownie bottom is from a box mix. I have never found a homemade brownie I like as much as the boxed version and I’ve tried tons! So I usually stick to the box, because why mess with the genius of the brownie mix? I prepared the brownie mix and then poured it into a very well greased 7-inch springform pan. You can use different sized springform pans, just note it will not be as “high” of a cheesecake with larger springform pans. Still just as tasty though, and perhaps even tastier for people that like thinner layers. This dish could also be prepared in a 9 x 13 dish and cut into bars. I even had the idea of doing a layer of oreos in between the brownie and cheesecake mixture – what do you think? Yum right! The oreos could also be a layer in a springform pan, you just may need to get creative about their placement or have to cut a few up to make sure there is an equal layer of oreos. Next up is the “cheesecake.” This gets frozen so it is more like an ice cream cheesecake, but it’s got all the great flavors. It’s super simple – cream cheese, sweetened condensed milk, and some thawed whipped topping. 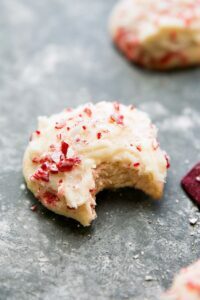 Then you can do the peppermint extract to your taste preference in case you like a less strong or stronger flavor than the recipe indicates. And same with the candy canes – feel free to increase or decrease the amount of crushed candy canes. Although this dessert takes about 8 hours to freeze and be fully set-up — it’s totally worth it! Plus it’s a nice dessert to make beforehand and have ready the next day – definitely important for how busy the holidays get! Oh, and lastly, if there are any leftovers, don’t forget to return this to the freezer. Preheat the oven to 350 degrees F. Grease a 7-inch (or larger, but I used 7-inch) springform pan. 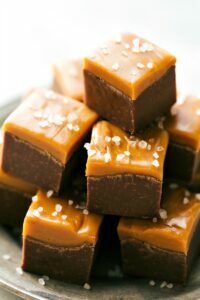 You could also do these in bars in a 9 x 13 pan. Prepare the brownie mix according to package instructions -- combining the eggs, vegetable oil, and water. Pour the brownie mix into the prepared pan and bake according to package directions until baked all the way through. Once it is smooth, slowly add in the sweetened condensed milk while continuing to beat the mixture. Beat until smooth. With a spatula, fold in the whipped topping to the mixture gently until completely combined. Taste the mixture and increase any of the peppermint flavors if desired. Make sure to not overstir or stir the mixture with the whipped topping too much. Pour the cheesecake mixture over the brownie mixture and freeze for at least 8 hours. Remove and allow to thaw out for about 5 minutes before cutting and serving. Chocolate…peppermint…AND cheesecake? This is basically everything that my dessert dreams are made of!! Love this easy dessert Chels! Have fun traveling 🙂 Pinned! Mmm ice cream is always a win in my book! It will be 5 degrees out and I will choose ice cream over any other dessert! Delish! 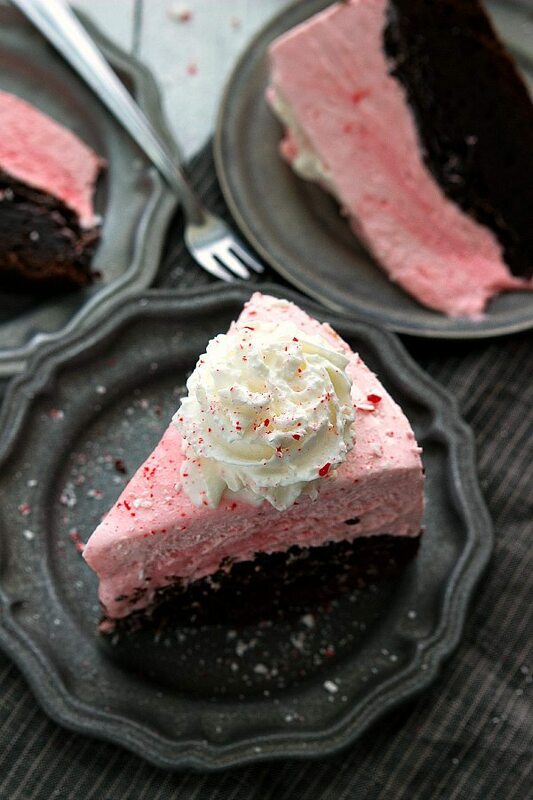 I’m such a huge fan of peppermint and cheesecake, so this looks amazing! And what a great idea to make a brownie crust! I’m seriously drooling over here, Chelsea! Pinned! Oh wow!! What a perfect combination of flavors! And it is so pretty and festive! And I am totally in love with your plates! Oh, Wow! This looks so amazingly yummy! That thick brownie crust with that minty cheesecake. You have outdone yourself! Pinned! What a lovely cake! I normally try to avoid box cake as possible but I can’t resist this one…. This cheesecake looks so cute and delicious! I love the brownie crust and peppermint flavor! Awesome pictures! Pinned! What a gorgeous cheesecake, Chelsea! It’s such a lovely shade of pink (which means it obviously tastes even better lol). 😀 And Peppermint cheesecake sounds to die for. 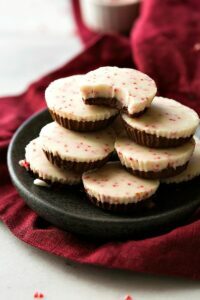 I make a peppermint cheesecake every year for Christmas, but this sounds AMAZING! Brownie crust? YES please! What a yummy make ahead desert! It may not be Thanksgiving yet, but I’m excited for Christmas! This looks beyond fantastic!! You had me at “brownie crust”…how ingenious! frozen cheesecakes are soooo good! this one looks fabulous. I love how easy this recipe is. I have to agree, there is a brownie mix that my mom always picks up from william sonoma and I swear it is the best brownies ever! Where did you get the idea for this recipe? Do you make a lot of your recipes up? I’m just curious about the GENIUS behind this!! I made a frozen pumpkin pie last year that was super popular and knew I wanted to do a christmas one this year! Then I was trying to think of a fun crust and tried a cake first which was gross then did a brownie which we all loved! I get inspiration from tons of places usually online from other recipes and the longer I blog the more ideas I have! omg this looks out of this world. 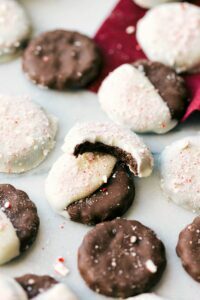 There is something about chocolate and peppermint that just screams holidays. love love love this! What a great holiday dessert Chelsea! 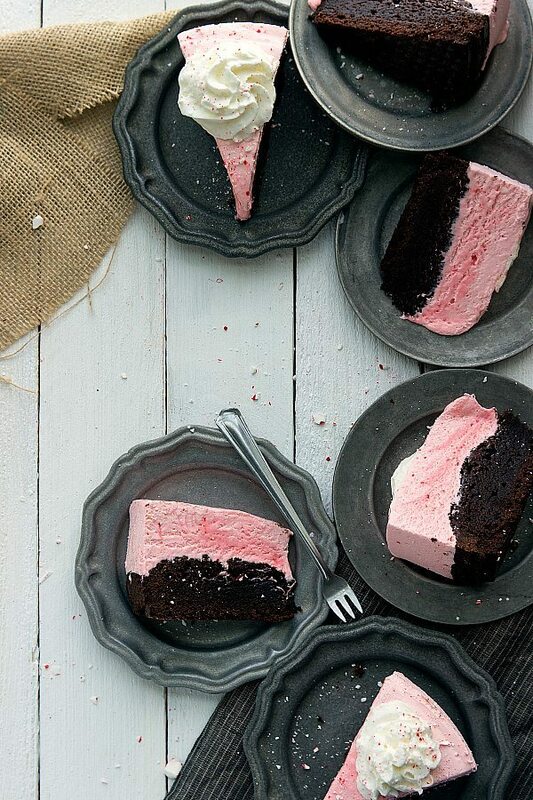 I love brownie and peppermint combined, and you just can’t beat a frozen cheesecake! I absolutely love the peppermint cheesecake layer! Combine that with the brownie layer! YUM! YUM! I absolutely love this Chelsea!! Oh my gosh, I would eat it ALL. Pinned! Oh my goodness Chelsea, I just died a little. That thick layer of pink peppermint looks absolutely incredible! Gorgeous dessert and so fun! Pinned! I actually am going to pin every single image- amazing photos buddy! I love how you used a box cake mix too- and peppermint and cheesecake just…I have no words. oh my gawd, these look crazy good!! and that brownie crust! love it! it’s about the same thickness as the cheesecake!! love!! Oh my god, can I please have a slice of this??! It looks so delicious and flavorful! Pinned! These do look pretty dang good…and just plain pretty, too! 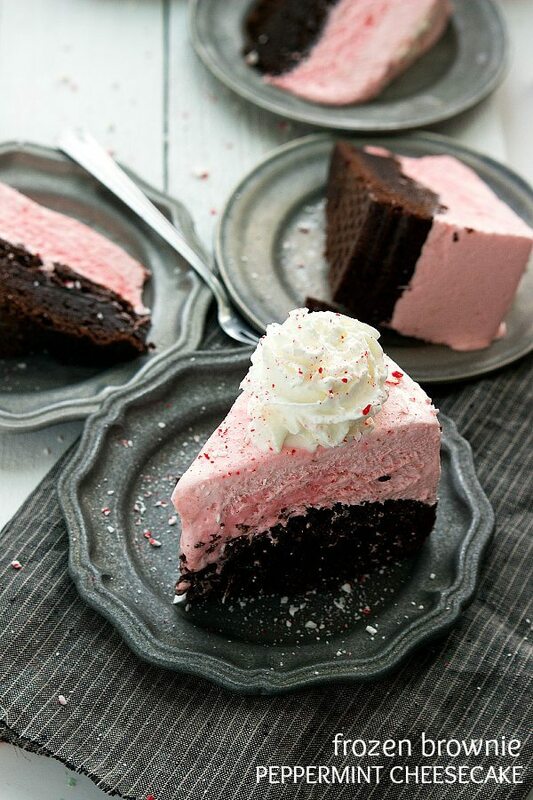 I love chocolate and peppermint — this looks divine! OMGosh Chelsea…this looks absolutely amazing! You made my mouth water at 6:30 a.m. and now I’m craving cheesecake. I’m definitely pinning this, because I have to try it! WOW what a cheesecake!! All the elements look so delicious and dreamy Chelsea! I really would love a slice (or eight) of this! Pinning definitely!! I’m dying over here. A brownie crust??? Chelsea, you are pure genius!! I’m totally trying that with a cheesecake sometime soon. And that gorgeous pink color is just so cute! 🙂 Pinned! Oh man, Chelsea. This cheesecake looks SOOOO good! And that brownie crust? Ugh YUM! I can’t wait to try this out for the holidays! Holy yum!! I want a piece of this cheesecake asap!! Ok, really I want 3 pieces!! 😉 Pinned! Ermagherd Chelsea… ERMAGHERDDDDD! These looks beyond incredible!!! Want times 1000!!! I’ve literally died and gone to heaven! Omg! These look so good, and the pictures are beautiful! I think the pink color makes them even more attractive – heard that red/pink should stimulate the appetite!